Do you have a person in your life who may be a hoarder? 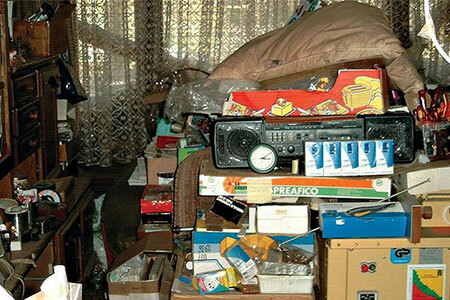 Hoarding is a condition where a person has persistent difficulty discarding personal possessions. The large amount of possessions fill the home and prevent the normal use of the space. Living space becomes cluttered. It may be unusable. Hoarding brings distress and emotional health concerns. Heating units may be too close to things that can burn. They might also be placed on unstable surfaces. If a heater tips over into a pile, it can cause a fire. Electrical wiring may be old or worn from the weight of piles. Pests could chew on wires. Damaged wires can start fires. Open flames from smoking materials or candles in a home with excess clutter are very dangerous. Blocked pathways and exits may hinder escape from a fire. Hoarding puts first responders in harm’s way. Firefighters cannot move swiftly through a home filled with clutter. Responders can be trapped in a home when exits are blocked. They can be injured by objects falling from piles. The weight of the stored items, especially if water is added to put out a fire, can lead to building collapse. Fighting fires is very risky in a hoarding home. It is hard to enter the home to provide medical care. The clutter impedes the search and rescue of people and pets. When talking a person who hoards, focus on safety rather than the clutter. Be empathetic. Match the person’s language. If they call it hoarding, then you can call it hoarding. Help the residents make a home safety and escape plan. Stress the importance of clear pathways and exits. Practice the plan often. Exit routes may change as new items are brought into the home. Install working smoke alarms in the home. Test them at least once a month. Reach out to community resources. Talk to members of the fire department to alert them of your concerns. They may be able to connect you with members of a hoarding task force for additional help.